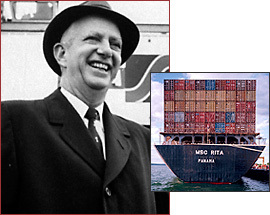 As McLean's first container ship left Newark harbor, a man asked Freddy Fields, a top official of the International Longshoremen's Association, "What do you think of that new ship?" Fields replied, "I'd like to sink that sonofabitch." Longshoremen strikes ensued, but the cost of shipping dropped by a factor of a hundred. While his name is relatively unknown today, this North Carolina trucker invented container shipping, an method now indispensable to the modern world of global trade. Malcom McLean was born into a North Carolina farming family in 1914. Struggling to assist his family during the Great Depression, he started a small trucking company to transport farmers' goods and supplies. His resourcefulness enabled him to expand to thirty trucks by 1940, and he was eventually able to sell McLean Trucking, a $12 million company with over 1700 trucks, by the mid-1950s. His years in the transportation business showed McLean the need for an easier method of shipping goods. He had watched dock workers unloading goods from trucks and transferring them to ships, and marveled at the inefficiency of the process. "Wouldn't it be great," he asked himself, "if my trailer could simply be lifted up and placed on the ship?" In 1955, he gambled big on a container venture, buying two oil tankers and securing a bank loan to buy $42 million worth of docking, shipbuilding, and repair facilities. He refitted the ships and designed trailers to stack below or on the decks. In April 1956, his first container ship, the Ideal X, departed Port Newark, New Jersey, headed for Houston. McLean named his new company Sea-Land, and rushed to expand it, exposing the business to financial instability. The venture required a lot of capital. His aggressive investment was rewarded by the Port of New York Authority's decision to develop a new container port in Elizabeth, New Jersey, anointing cargo shipping as the method of the future. McLean's cargo shipped faster and cheaper, because loading and unloading were shortened at each end of the voyage. The sealed cargo reduced the pilfering that went on at various stages of the cargo's journey and also reduced the labor required. The Vietnam War aided his efforts to expand into Asia, and as more ports adapted to the containers, shipping was revolutionized. Nearly every imported consumer good imaginable owes its lower price to the container revolution. McLean sold Sea-Land for $160 million in 1969. He produced more inventions in his lifetime, including a means of lifting patients from a stretcher to a hospital bed. In 1978, restless, McLean returned to shipping, introducing enormous "econoships" to carry cargo at the equator while smaller ships came and went from them, picking up and delivering containers. McLean died in 2001, relatively unknown considering the broad impact of his innovation.